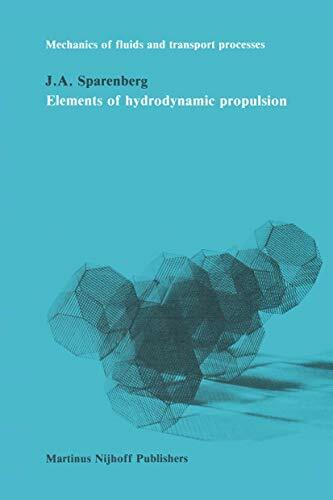 This is a treatment of a number of aspects of the theory of hydrody­ namic propulsion. It has been written with in mind technical propulsion systems generally based on lift producing profiles. We assume the fluid, which is admitted in conventional hydrody­ namics, to be incompressible. Further we assume the occurring Reynolds numbers to be sufficiently high such that the inertia forces dominate by far the viscous forces, therefore we take the fluid to be inviscid. Of course it must be realized that viscosity plays an important part in a number of phenomena displayed in real flows, such as flow separation at the nose of a profile and the entrainment of fluid by a ship's hull. Another ap­ proximation which will be used in general is that the problems are linearized. In other words it is assumed that the induced disturbance velocities are sufficiently small, such that their squares can be neglected with respect to these velocities themselves. Hence it is necessary to evaluate the domain of validity of the results with respect to these two a priori assumptions. Anyhow it seems advisable to have first a good understanding of the linearized non-viscous theory before embarking on complicated theories which describe more or less realistic situations. For elaborations of the theory to realistic situations we will refer to current literature. In low Reynolds number flow, singular external forces and moments are very useful.